Occupation: Working at his father's fix-it shop. Story: Eddie Collins was an unnaturally good boy. He had never told a lie, cheated or allowed a single injustice to go unavenged. When the New Man saw Eddie save someone, he thought that Eddie would be a good vessel for the Spirit of Justice which was the spirit driving ShadowHawks thru the time. He gave the ShadowHawk robot's head containing the spirit to Eddie who absorbed the spirit becoming the new ShadowHawk . What happened to Collins after he became ShadowHawk has not been revealed. He helped fighting back the Martians during their invasion  and he was a part of saving the World when Entropy tried to reshuffle the Multiverse . It must be assumed that he is still ShadowHawk. 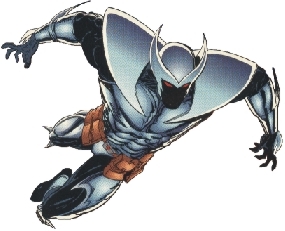 Equipment: Collins wears a ShadowHawk armor like the one created by Christina Reid and Carlton Sum only fitted with wrist blades and no grappling hook or shuriken/boomerang.